Oops, I did it again! (Really can’t believe I just made Britney reference, I don’t even like her music). Ehem, I did it again! I had so much fun making my first ever YouTube video, and better yet, it seems like you had fun watching it. I received so many lovely comments across social media, they really made me feel special. I particularly liked the comment from naonao.hgc in Instagram “Wow you’re moving and talking”! Haha. Yes, I move and talk in real life… I’m actually not very good at sitting still, I’m full of beans you might say (bad joke alert)! So after a bit of a hiccup (recording most of the video with my microphone off, AGH!) I present you with YouTube video number 2! Let me know if you are digging this video and if you have any requests for more videos! You like hummus, I know you do. If you are on this blog, I am going to guess that 99.7% of you like hummus. 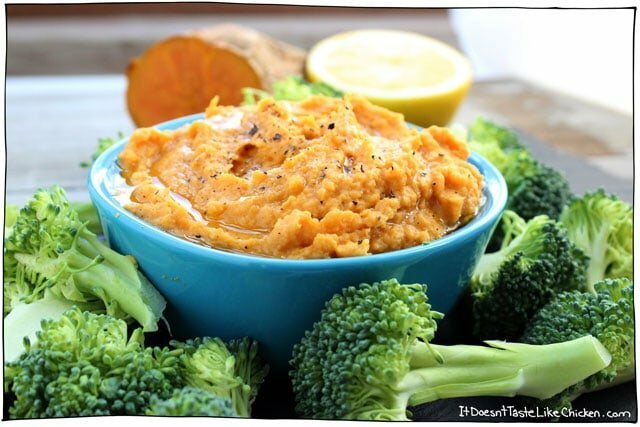 If you don’t like hummus, I dare you not to like this sweet potato hummus! In my opinion, plain hummus is fine, I guess, but sweet potato hummus… um, yes please! I don’t use tahini in this recipe for two reasons: one, I rarely have it on hand, and more importantly, two, I actually kinda hate tahini (which is weird because I love sesame seeds). It always tastes bitter and sour to me. I prefer to make hummus with delicious things. The result is a hummus that is sweet, fragrant, creamy, and packed full of flavour. 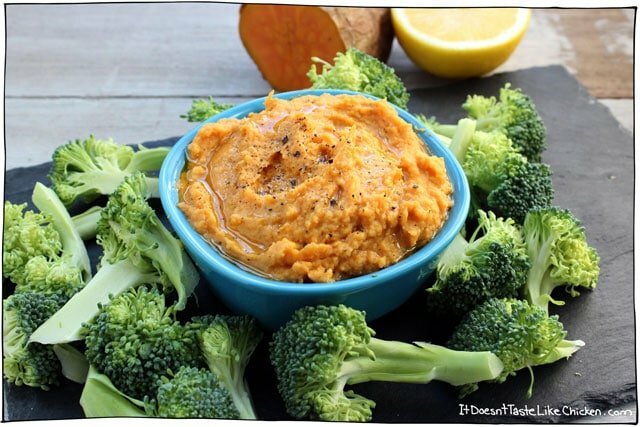 Basically if you like sweet potatoes, you will like this sweet potato hummus. (Obvi right)? If you want to keep the sweet potato vibe going, also check out my Thai Sweet Potato Curry, Jerk Sweet Potato & Black Bean Burgers, and Roasted Sweet Potato and Plantain Burritos. First we need to cook the sweet potato! So crank your oven to 400F, pierce the potato all over with a fork so that steam can escape, and pop it in the oven for 50 to 65 minutes until the potato is tender all the way through and easily pierced with a knife. You can bake the sweet potato up to a few days in advance if you like. 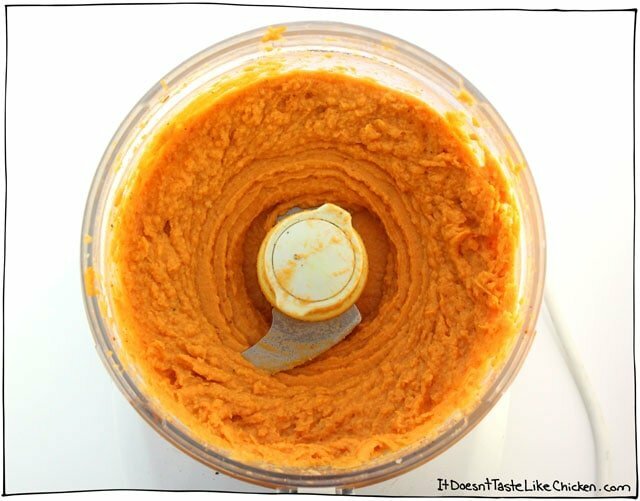 When you are ready to make your hummus, scoop the flesh out of the sweet potato, and add it to a food processor along with the other ingredients. Blend until smooth and creamy. I generally like a thicker hummus, but if you prefer it a little thinner, just add more oil or water until desired consistency is reached. Serve with tortilla, crackers, or your favourite veggies for dipping! Omnomnom. This is the perfect way to take hummus from boring to sensational. An easy recipe that can be prepared ahead of time with video instruction included. Makes a great party appetizer. Use a fork to prick the sweet potato all over so steam can escape while the potato cooks. Put on a baking sheet, and bake for about 50 - 65 minutes, until the potato is tender all the way through, and a knife can easily pierce through the entire potato. 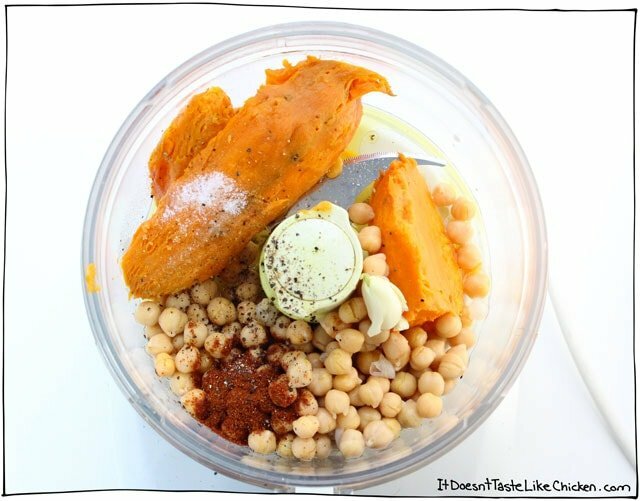 Scoop out the flesh of the potato and add to a food processor along with the remaining ingredients, the chickpeas, garlic, lemon, water, salt, chili powder, and pepper. Blend until completely smooth, stopping to scrape down the sides as needed. If you prefer a thinner hummus, just thin it with a bit more water or oil until desired consistency is reached. I hope you love it, Liza! Ahhhhh! Sweet potato is pretty much one of my favorite things to eat of all time and making it into a hummus makes me very excited. I loved this video, it’s informative and very funny. The editing is really awesome. Thanks for the inspiration! Haha thank you Jenny! 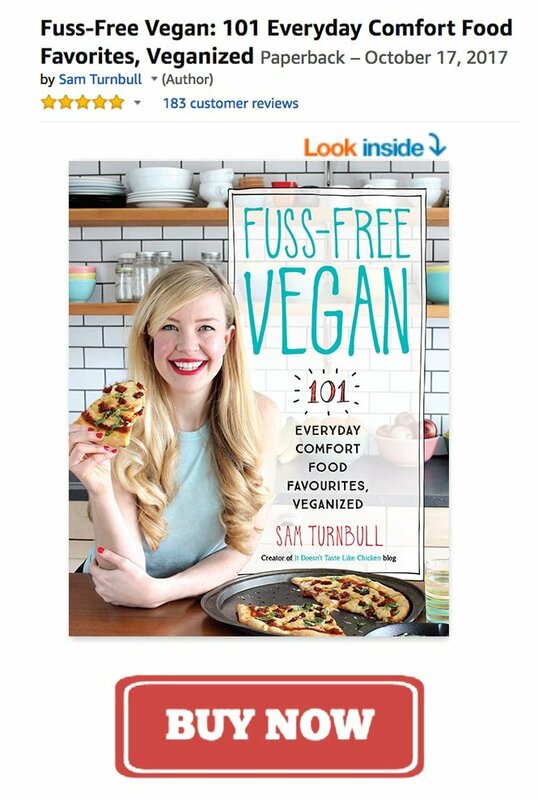 Very glad you like the recipe and the video. 🙂 I had a lot of fun making both! I just nuked my sweet potato for six minutes. Sure, everything is better roasted but I feel guilty about heating the oven for one potato. I’m only cooking for myself, so there’s nothing else going into the oven. Haha that’s totally ok! I actually don’t own a microwave which is why I will never give instructions for one. However you make your hummus is the perfect way! I’m ashamed that my favorite food…the potato…has never made it into one of my hummus creations! Yes! Tahini dressings, bleh. I have no desire for them at all. 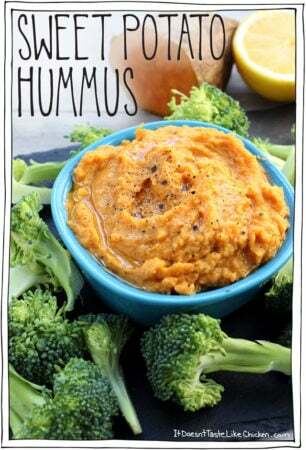 I just skip it in this recipe, but in my Roasted Jalapeño Hummus Recipe I use peanut butter instead which is super yum! I was wondering if I would like tahini better after being vegan for a couple years. I certainly look at sweet potatoes in a whole new way, but, tahini is expensive. So, if you two can live without it, I think I can. Haha! There is no need for tahini. If you don’t like it, skip it!